While Raydiant Lightware is a 21st century technology, the foundations for a theory of how it works can be traced back to the ancient teachings of Pythagorus and Plato. Plato, coming 150 years later, expanded Pythagorean thought, distinguishing a world of Form-Ideas (Eidos) from that of the manifest world of particulars. In the hierarchy of reality, this world of Forms is eternal as well as foundational: there is a corresponding Form for everything that exists. While always keeping their own integrity, the Forms are connected to the changing, perishable world, and act as templates for what can become manifest there. In this way, the Forms are archetypal. Plato went so far as to identify five geometric forms—the tetrahedron, hexahedron, octahedron, dodecahedron, and the icosahedron—that he felt reflected the essential parts and principles of the universe. 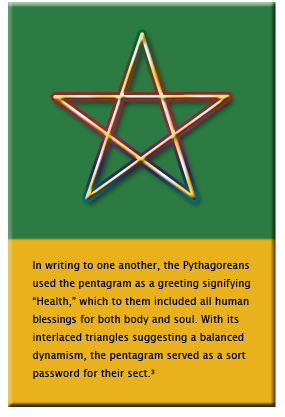 The study of these "sacred geometries" has come down through the centuries. In the 20th century we can find descriptions of reality across the disciplines that are analogous to those of the ancient Greek philosophers. Consider reknowned physicist David Bohm's notion of an implicate order that exists in pre-space in the form of an algebra or other pregeometry, representations of which arise in the explicate order (or spacetime manifold) otherwise known as the world we experience. Twentieth century biologists also crafted theories postulating the existence of a non-material realm shaping our life. Cambridge scientist Rupert Sheldrake developed the idea of morphogenetic fields in embryology. Distinct from the cells themselves but connected to them as a memory field, these morphogenetic fields, through morphic resonance, inform the embryo's cellular development and function. Furthermore, according to Sheldrake, organizing fields of animal and human behavior, of social and cultural systems, and mental activity, can all be regarded as morphic fields which contain an inherent memory that influences living things. Importantly, this theory allows for information from individual experience to add to the larger morphic field memory. Psychologist and seminal thinker, Carl Jung postulated the existence of a collective unconscious separate from a personal unconscious. This second psychic system is universal and impersonal, and is inherited. It consists of pre-existent forms, or archetypes. These archetypes provide a prototype or model for development and expression which is emulated and personified in an individual. archetype for Jung is a primoridal image which is never seen directly, though it gives definite form to certain psychic contents that shape a person's experience and behavior.4 These archetypes inform characters in art as well, as we seek to depict who we are, how we act and should act. These are tropes we all recognize and are even inspired by. Examples of archetypes include the Child, the Hero, the Martyr, the Damsel in Distress, the Great Mother, the Trickster, and the Warrior, to name a few. Consider the figures in the images to the left. 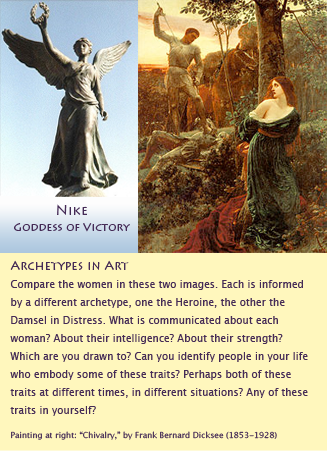 Answering the questions may help you identify archetypal energies alive in you. Perhaps the most interesting source for a modern construct of an eternal domain informing the universe is Pierre Teilhard de Chardin. De Chardin was a French philosopher and Jesuit priest who was trained as a paleontologist and geologist. He taught physics and chemistry in Egypt. Later, studying theology back in England, he synthesized his scientific, philosophical and theological knowledge inside a discourse of evolution, coining the term Omega Point to describe the maximum level of complexity and consciousness achievable. This supreme point of complexity and consciousness is transcendent and independent of the universe. For de Chardin, the Omega Point exists before the universe's evolution; indeed, it is responsible for the development of the universe toward more complexity, consciousness, and personality. While these ideas remain controversial, they are nonetheless the ideas of prominent thinkers in their fields . 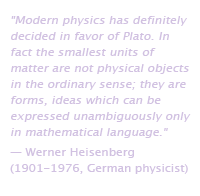 . . ideas that similarly converge on the existence of an archetypal or mathematical geometric reality that, while "outside" this one, at the same time informs it. Perhaps this question will never be definitively answered—a thorough discussion is beyond the scope of my purposes here—but for me these theories provide a sufficient way of understanding a basis for the nature and function of Raydiant Lightware. 1Numerology is one discipline that has explored and articulated what these principles are, which numbers they are connected to, and how they may be presenting in your life. 2Helena Blavastky, The Secret Doctrine, Vol IV. Theosophical University Press, 1888. 3Lucian of Samosata (c. 120 - 180 CE), from The Works of Lucian of Samosata, tr. H.W. Fowler.